The Mariners held their own against the Rangers through the first 5 innings as Kevin Millwood and Matt Harrison dueled it out. The M's were on the board first after a double by Chone Figgins and a sac bunt by Ichiro moved him to third. Then, catcher Jesus Montero hit a single to right to score Figgins. Wait, did I say Figgins? Weird! In the bottom of the 2nd, Nelson Cruz went yard off of Millwood to tie the score at 1. After that, both pitchers sailed on, though Kevin Millwood was done after just 5 innings of work with 97 pitches. In the 6th inning, Steve Delabar came in to replace Millwood. He started off by walking Adrian Beltre and giving up a single to David Murphy that put Beltre on third. 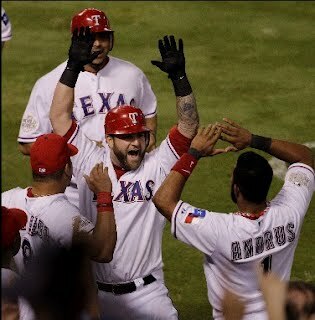 With nobody out, he got Nelson Cruz to strikeout and tried to get Mike Napoli to hit into a double play. Instead, on a 2 and 0 count, Delabar threw Napoli a fastball and got shell shocked. Napoli hit it deep off the facade of the upper deck in right field for a 3 run homerun. OUCH! Delabar was done and the bullpen would not surrender any more runs the rest of the game, but the 4 runs would be enough for Texas. In the top of the 8th inning, Michael Saunders singles and then Brendan Ryan hit a line drive to center that eluded the diving Craig Gentry and went all the way to the wall. After watching the ball get passed Gentry, Ryan kept trucking, around second, third and got nailed at the plate trying to make it an inside the park homerun. Nelson Cruz and Ian Kinsler combined for a perfect relay to the plate and snuffed out any momentum that the Mariners would have. With one out in the ninth, the M's would try and strike again. This time beginning with a walk by Jesus Montero that brought the hot hitting Justin Smoak to the plate. As we were all hoping he would launch one and tie the game up, he worked the count to 2 and 2 and grounded into a double play to end the game and send the Mariners to their 5th straight loss. The M's are now 21 and 30 on the season and we keep going backwards as we are now 11 games back from the Rangers. Now it's up to Jason Vargas as he takes the hill tomorrow versus the Rangers and Scott Feldman. We'll see what happens.